How to Cite This Chapter: Morey-Vargas OL, Montori VM, Sieradzki J, Płaczkiewicz-Jankowska E. Diabetes Mellitus. McMaster Textbook of Internal Medicine. Kraków: Medycyna Praktyczna. https://empendium.com/mcmtextbook/chapter/B31.II.13.1 Accessed April 24, 2019. American Diabetes Association. Standards of Medical Care in Diabetes – 2015. Diabetes Care 2015;38(Suppl 1):S1-S93. Inzucchi SE, Bergenstal RM, Buse JB, et al; American Diabetes Association (ADA); European Association for the Study of Diabetes (EASD). Management of hyperglycemia in type 2 diabetes: a patient-centered approach: position statement of the American Diabetes Association (ADA) and the European Association for the Study of Diabetes (EASD). Diabetes Care. 2012 Jun;35(6):1364-79. doi: 10.2337/dc12-0413. Epub 2012 Apr 19. Review. Erratum in: Diabetes Care. 2013 Feb;36(2):490. PubMed PMID: 22517736; PubMed Central PMCID: PMC3357214. Lipsky BA, Berendt AR, Cornia PB, et al; Infectious Diseases Society of America. 2012 Infectious Diseases Society of America clinical practice guideline for the diagnosis and treatment of diabetic foot infections. Clin Infect Dis. 2012 Jun;54(12):e132-73. doi: 10.1093/cid/cis346. PubMed PMID: 22619242. Evert AB, Boucher JL, Cypress M, et al; American Diabetes Association. Nutrition therapy recommendations for the management of adults with diabetes. Diabetes Care. 2013 Nov;36(11):3821-42. doi: 10.2337/dc13-2042. Epub 2013 Oct 9. PubMed PMID: 24107659; PubMed Central PMCID: PMC3816916. Malik VS, Popkin BM, Bray GA, Després JP, Willett WC, Hu FB. Sugar-sweetened beverages and risk of metabolic syndrome and type 2 diabetes: a meta-analysis. Diabetes Care. 2010 Nov;33(11):2477-83. doi: 10.2337/dc10-1079. Epub 2010 Aug 6. Review. PubMed PMID: 20693348; PubMed Central PMCID: PMC2963518. Cooke D, Bond R, Lawton J, et al; U.K. NIHR DAFNE Study Group. Structured type 1 diabetes education delivered within routine care: impact on glycemic control and diabetes-specific quality of life. Diabetes Care. 2013 Feb;36(2):270-2. doi: 10.2337/dc12-0080. Epub 2012 Nov 8. PubMed PMID: 23139374; PubMed Central PMCID: PMC3554294. Ly TT, Nicholas JA, Retterath A, Lim EM, Davis EA, Jones TW. Effect of sensor-augmented insulin pump therapy and automated insulin suspension vs standard insulin pump therapy on hypoglycemia in patients with type 1 diabetes: a randomized clinical trial. JAMA. 2013 Sep 25;310(12):1240-7. doi: 10.1001/jama.2013.277818. PubMed PMID: 24065010. Bergenstal RM, Klonoff DC, Garg SK, et al; ASPIRE In-Home Study Group. Threshold-based insulin-pump interruption for reduction of hypoglycemia. N Engl J Med. 2013 Jul 18;369(3):224-32. doi: 10.1056/NEJMoa1303576. Epub 2013 Jun 22. PubMed PMID: 23789889. Mullan RJ, Montori VM, Shah ND, et al. The diabetes mellitus medication choice decision aid: a randomized trial. Arch Intern Med. 2009 Sep 28;169(17):1560-8. doi: 10.1001/archinternmed.2009.293. PubMed PMID: 19786674. Siu AL; U.S. Preventive Services Task Force. Screening for Abnormal Blood Glucose and Type 2 Diabetes Mellitus: U.S. Preventive Services Task Force Recommendation Statement. Ann Intern Med. 2015 Dec 1;163(11):861-8. doi: 10.7326/M15-2345. Epub 2015 Oct 27. PubMed PMID: 26501513. Canadian Task Force on Preventive Health Care, Pottie K, Jaramillo A, Lewin G, et al. Recommendations on screening for type 2 diabetes in adults. CMAJ. 2012 Oct 16;184(15):1687-96. doi: 10.1503/cmaj.120732. Erratum in: CMAJ. 2012 Nov 6;184(16):1815. PubMed PMID: 23073674; PubMed Central PMCID: PMC3478353. Diabetes mellitus (DM) is a group of metabolic disorders characterized by hyperglycemia resulting from abnormal secretion or effects of insulin. Chronic hyperglycemia in the course of DM is associated with damage, dysfunction, and failure of multiple organs, particularly the eyes, kidneys, peripheral nerves, heart, and blood vessels. 1. Type 1 DM is caused by the destruction of the pancreatic beta cells due to an autoimmune process (type 1A, associated with beta-cell autoantibodies) or due to unknown mechanisms (idiopathic or type 1B) that typically results in an absolute insulin deficiency. Type 1 DM develops more frequently in children, adolescents, and younger adults. The disease occurs in genetically susceptible individuals with particular gene polymorphisms and in many cases appears to be triggered by environmental factors (eg, perinatal events, viral infections, ingestion of cow’s milk). The autoantibodies may appear several years before the symptoms of DM are observed. After the disease onset, the process of the destruction of beta cells continues for some time until the total destruction of the cells. In some cases, an autoimmune destruction of beta cells leads to the onset of DM in older adults (latent autoimmune diabetes in adults [LADA]; Table 1). These patients initially appear to have type 2 DM, but have positive circulating beta-cell autoantibodies and progress to insulin dependence after a few months or years. LADA includes a heterogeneous group of patients, with some having high titers of beta-cell autoantibodies and progressing to insulin dependence faster. The disappearance of serum C-peptide (see Diagnostic Tests, below) indicates a total destruction of beta cells. 2. Type 2 DM is the most common form of DM (~90% of cases). It is characterized by varying degrees of insulin resistance coexisting with progressive impairment of insulin secretion. Hyperglycemia occurs when the insulin secretory capacity is inadequate to overcome the peripheral insulin resistance; both genetic (polygenic inheritance) and environmental factors (obesity, particularly abdominal obesity, and low physical activity) play a strong role in the occurrence of insulin resistance. The hereditary component results in significant differences in the prevalence of type 2 DM among ethnic groups (eg, type 2 DM is common in Pima Indians and North American Indians). The physiopathologic pathways leading to insulin resistance and deficient insulin secretion are not completely understood, but it appears that an excessive release of free fatty acids by visceral adipose tissue, lipotoxicity caused by these free fatty acids, the effects of several adipokines, and chronic inflammation associated with obesity all play a role in the development of DM and also contribute to the cardiovascular complications of this disease. 3. Other specific types of DM may be caused by genetic defects of pancreatic beta-cell function (eg, maturity-onset diabetes of the youth [MODY]—a group of autosomal dominant monogenic defects of insulin secretion that lead to DM diagnosed at a young age and with negative beta-cell autoantibodies [Table 2]), genetic defects of insulin action, pancreatic exocrine disorders, endocrinopathies (eg, Cushing syndrome; acromegaly; catecholamine-producing tumors, including pheochromocytomas, glucagonomas, somatostatinomas), drug-induced DM (eg, glucocorticoids), viral infections (eg, congenital rubella), rare immune-mediated DM (eg, stiff man syndrome), and other genetic syndromes associated with DM (eg, Down syndrome, Klinefelter syndrome, Turner syndrome, Wolfram syndrome, and maternally inherited DM and deafness). 4. Gestational DM is due to pregnancy-related elevation of hormones antagonistic to insulin leading to insulin resistance, increased insulin requirements, and increased glucose availability for the developing fetus. These mechanisms result in an increased risk of abnormal glucose metabolism in otherwise healthy women. 1. The natural history of DM depends on the rate and extent of beta-cell dysfunction and destruction. In type 2 DM, at the initial stages of the disease, the early phase of insulin secretion in response to a meal disappears, reflecting the presence of beta-cell dysfunction. As the disease progresses, patients typically go from a stage of mild hyperglycemia (eg, prediabetes) to overt DM. Signs and symptoms are nonspecific and variable; they are associated with the type of DM and dynamics of the disease progression and are significantly more common in type 1 DM than in type 2 DM. This is also true for ketoacidosis and coma. Because of difficulties in achieving complete DM control, the development of chronic complications cannot be fully prevented (see Chronic Complications of Diabetes). 2. Typical signs and symptoms of DM: Nonspecific and variable, including polyuria (osmotic diuresis caused by glucosuria when serum glucose rises >10 mmol/L [180 mg/dL]), nocturia, polydipsia (increased thirst), blurred vision, weight loss, weakness, and signs of hypovolemia (eg, decreased skin turgor, dry skin and mucous membranes, hypotension). Hyperglycemia may become particularly evident during a concurrent illness (eg, infection). 2) Type 2 DM: In contrast, >50% of patients with type 2 DM are asymptomatic when the diagnosis is made (the disease is frequently detected incidentally or on screening glucose measurements). The majority of patients with type 2 DM are obese, most commonly showing abdominal-type obesity, and frequently have a cluster of comorbidities that includes hypertension and dyslipidemia (with low serum high-density lipoprotein cholesterol [HDL-C] and high triglyceride concentrations). Insulin resistance is a key feature in type 2 DM, although it is not a pathognomonic finding of this type of DM (eg, obese patients with type 1 DM may have varying degrees of insulin resistance). 1) Blood glucose: Fasting plasma glucose (FPG) in venous blood (reference range, 3.9-5.5 mmol/L [70-99 mg/dL]) is used as a diagnostic test for DM and for monitoring glycemic control, whereas glucose levels in capillary full blood (measured using a glucometer) are used only for monitoring DM treatment. 2) Glycated hemoglobin (HbA1c) reflects the mean glycemia over the 3 months preceding the test. It is used both for the diagnosis of DM and for the evaluation of the metabolic control of the disease. The advantage of this test is that it can be measured at any time during the day and it is not affected by acute blood glucose level changes. When interpreting the results of the test, consider other conditions that may affect its accuracy; if a condition results in a shorter life span and greater proportion of younger erythrocytes (eg, hemolytic anemias), then falsely low HbA1c values are likely. Red blood cell transfusion can also decrease HbA1c levels in patients with DM. In contrast, a longer erythrocyte life span is associated with longer exposure to elevated blood glucose, hence falsely increasing the HbA1c levels (eg, iron or vitamin B12 deficiency anemias). 3) A 75-gram oral glucose tolerance test (OGTT) can be used for screening or diagnosis of DM. In this test, a patient without an acute illness is instructed to eat a diet with normal carbohydrate content in the days before the test. The OGTT is performed in the morning after 8 to 12 hours of fasting and includes the measurement of FPG. A plasma glucose measurement is obtained 2 hours after the ingestion of 75 g of glucose in the form of a solution. Normal plasma glucose levels at 2 hours are <7.8 mmol/L (140 mg/dL). A modified version of this test is used to diagnose gestational DM. 4) Urine glucose: Glucosuria is typically seen in patients with DM when the blood glucose level rises >10 mmol/L (180 mg/dL). In patients without DM, this can result from defects in renal tubular function (eg, proximal renal tubular acidosis). Measurement of urine glucose is not useful for screening, diagnosis, or monitoring DM treatment. However, finding glucosuria is an indication for blood glucose tests. 5) Fructosamine: This rarely used test demonstrates mean glycemia over the preceding 2 weeks (the half-life of albumin). Fructosamine levels are mainly measured in patients in whom HbA1c is unreliable or in whom it is necessary to evaluate short-term blood glucose control (eg, pregnant women). a) Antibodies to glutamate decarboxylase 65 (anti-GAD65). b) Antibodies against tyrosine phosphatase-related proteins (IA-2, IA-2 beta). d) Beta-cell-specific zinc transporter antibody (ZnT-8). 7) The serum C-peptide level reflects endogenous insulin levels. It is decreased or undetectable in type 1 DM, elevated in early type 2 DM (when insulin resistance is a dominant mechanism and insulin secretion increases), and decreased in type 2 DM after the deterioration of beta-cell secretory capacity. Measurements of C-peptide levels are not required in most cases of DM. Screening for type 1 DM is not recommended, because this condition is rare and there are no interventions to prevent the progression of subclinical disease. In contrast, type 2 DM is common, develops slowly, can be asymptomatic for a relatively long time, and can be treated at an early stage to prevent or delay its complications. 2) A first-degree relative with DM. 3) A high-risk race/ethnicity (eg, African American, Latino, Native American, Asian American, Pacific Islander). 4) Delivery of a baby weighing >4.08 kg or confirmed diagnosis of gestational DM. 5) Hypertension (≥140/90 mm Hg or receiving therapy for hypertension). 6) An HDL-C level <0.90 mmol/L (35 mg/dL) and/or a triglyceride level >2.82 mmol/L (250 mg/dL). 8) HbA1c ≥5.7% (39 mmol/mol), impaired glucose tolerance (IGT), or impaired fasting glucose (IFG) on previous testing. 9) Other clinical conditions associated with insulin resistance (eg, severe obesity, acanthosis nigricans). 10) A history of cardiovascular disease. In the absence of the above criteria, testing for DM should begin at the age of 45 years. FPG, HbA1c, and a 75-gram OGTT are appropriate tests for screening. If results are negative, the ADA recommends repeating testing at least at 3-year intervals, with consideration of more frequent testing depending on the initial results and presence of risk factors. Other organizations issued similar suggestions, noting that the quality of evidence supporting the type of screening and its overall benefit is at most moderate. Diabetes mellitus screening tests in pregnant women: see Gestational Diabetes. The diagnostic workup in patients with hyperglycemia should not be performed during acute phases of other diseases (eg, infection or acute coronary syndrome), immediately following trauma or surgery, or during treatment with drugs that may cause elevated blood glucose levels (eg, glucocorticoids, thiazide diuretics, certain beta-blockers). 1) There are typical signs and symptoms of hyperglycemia (eg, increased thirst, polyuria, weight loss, blurry vision, weakness) or hyperglycemic crisis and a random plasma glucose level ≥11.1 mmol/L (200 mg/dL). 2) HbA1c ≥6.5% (48 mmol/mol) (using a certified method), or FPG ≥7.0 mmol/L (126 mg/dL) (fasting is defined as no caloric intake for at least 8 hours), or 2-hour plasma glucose ≥11.1 mmol/L (200 mg/dL) during a 75-gram OGTT. In the absence of unequivocal hyperglycemia, one abnormal test should be confirmed by repeating the same test on a subsequent day. If 2 different tests are available (eg, FPG and HbA1c) and both are consistent with DM, additional testing is not needed. If results of different tests are discordant, the test that is diagnostic of DM should be repeated. 1) HbA1c between 5.7% and 6.4% (39-46 mmol/mol). 2) IFG (FPG between 5.6-6.9 mmol/L [100-125 mg/dL]). 3) IGT (2-hour plasma glucose after the 75-gram OGTT between 7.8-11.0 mmol/L [140-199 mg/dL]). 1. Other causes of clinical signs and symptoms, eg, polyuria (diabetes insipidus). 2. Other causes of hyperglycemia: Stress-induced hyperglycemia, which refers to transient hyperglycemia, may occur during acute illness or significant stress in patients without DM (eg, sepsis, acute coronary syndrome, immediately following trauma or a major surgery). 1) Patient education, which is indispensable for treatment success. 2) Nonpharmacologic management: Nutrition, weight loss, and exercise. 3) Glucose-lowering treatment: Oral and injectable antidiabetic agents, insulin. 4) Management of other cardiovascular risk factors, particularly hypertension and dyslipidemia (see Hypercholesterolemia). 5) Prevention and management of chronic diabetic complications. 2. In type 1 DM, treatment with insulin is mandatory from the beginning of recognition of this disease. 3. In type 2 DM, lifestyle modification and weight loss are the fundamental aspects of care; metformin is typically the first medication used. Type 2 DM is a progressive disease; therefore, second-line and third-line agents are frequently required for appropriate glycemic control. Different glucose-lowering medications are currently available, including insulin secretagogues (eg, sulfonylureas, meglitinides, dipeptidyl peptidase-4 [DPP-4] inhibitors, glucagon-like peptide-1 [GLP-1] receptor agonists), insulin sensitizers [eg, metformin, thiazolidinediones (TZDs)], alpha-glucosidase inhibitors (eg, acarbose), and sodium-glucose cotransporter 2 (SGLT-2) inhibitors (eg, canagliflozin or empagliflozin). 4. In type 2 DM, insulin therapy is indicated in patients not achieving appropriate glycemic control with other medications. Insulin should also be started in patients with type 2 DM and marked hyperglycemia at the time of diagnosis (eg, HbA1c >11% [97 mmol/mol]) and in patients with hyperglycemic crisis [ie, diabetic ketoacidosis (DKA), hyperosmolar hyperglycemic state (HHS)]. If insulin treatment is used early in the course of the disease due to beta-cell glucotoxicity, the recovery of beta-cell function after achieving adequate control of hyperglycemia may allow de-escalation of insulin therapy and often switching to oral antidiabetic medications. 5. Type 2 DM is a progressive disease with gradual deterioration of the secretory capacity of the pancreatic beta cells; therefore, many patients with type 2 DM eventually need insulin therapy. 6. If the type of DM is unclear (ie, type 1 versus type 2 DM) in a patient presenting with a hyperglycemic crisis, the final diagnosis and appropriate long-term treatment can be established after the control of metabolic abnormalities is achieved with insulin therapy. If an autoimmune etiology of DM is excluded, patients can be sometimes successfully switched to oral glucose-lowering medications. 7. In patients who do not achieve the target HbA1c levels despite maintaining target FPG, make attempts to reduce postprandial glucose levels. 8. The target HbA1c levels should be achieved gradually (ie, over several months) because a rapid reduction of plasma glucose levels carries a risk of hypoglycemia (particularly in type 1 DM), and in patients with advanced microangiopathy (primarily retinopathy) it may accelerate progression of this complication. Also, in type 2 DM it may increase the cardiovascular risk. a) Target HbA1c levels <7.0% (53 mmol/mol) and preprandial capillary blood glucose levels between 3.9 and 7.2 mmol/L (70-130 mg/dL) in most nonpregnant adults with DM; to achieve this in young patients with type 1 DM, a multiple daily injection insulin therapy is usually required. ADA experts acknowledge that individual patients’ goals may be slightly lower or slightly higher. We consider recommendation to achieve this target as strong in type 1 DMEvidence 1Strong recommendation (benefits clearly outweigh downsides; right action for all or almost all patients). Moderate Quality of Evidence (moderate confidence that we know true effects of intervention). Quality of Evidence lowered due to heterogeneity of effects in individual patients. For discussion and references, see Appendix 1 at the end of the chapter. and weak in type 2 DM.Evidence 2Weak recommendation (benefits likely outweigh downsides, but the balance is close or uncertain; an alternative course of action may be better for some patients). Moderate Quality of Evidence (moderate confidence that we know true effects of intervention). Quality of Evidence lowered due to heterogeneity of effects in individual patients. For discussion and references, see Appendix 1 at the end of the chapter. b) HbA1c levels <6.5% (48 mmol/mol) are suggested for selected patients with a short duration of DM, long life expectancy, and no significant cardiovascular disease, as long as treatment does not induce significant hypoglycemia. c) In contrast, the criteria of DM control may be less stringent (HbA1c <8.0% [64 mmol/mol]) in the elderly, in patients with significant comorbidities, advanced microvascular or macrovascular complications, limited life expectancy, and in patients who developed hypoglycemia unawareness or those with severe or frequent episodes of hypoglycemia. d) Considering the lack of clear benefits on major outcomes, the risk of hypoglycemia, and the potential burden and higher costs of more intensive treatment, a strong recommendation against intensive glycemic control (eg, HbA1c ≤6.5% [48 mmol/mol]) can be made for older patients with long-standing type 2 DM and risk for cardiovascular disease.Evidence 3Strong recommendation (downsides clearly outweigh benefits; right action for all or almost all patients). Moderate Quality of Evidence (moderate confidence that we know true effects of intervention). Quality of Evidence lowered due to indirectness of evidence to that particular population. For discussion and references, see Appendix 1 at the end of the chapter. e) The role of postprandial blood glucose targets is unclear, because outcome studies have relied mostly on HbA1c and preprandial glucose levels for assessing the glycemic effect of the evaluated interventions. According to the ADA, postprandial testing aiming for blood glucose values <10 mmol/L (180 mg/dL) 1 to 2 hours after the beginning of a meal is a reasonable strategy in patients with high HbA1c and preprandial glucose levels within target values. – Premeal, bedtime, and overnight glucose: 3.3 to 5.4 mmol/L (60-99 mg/dL). – Peak postprandial glucose: 5.4 to 7.1 mmol/L (100-129 mg/dL). – HbA1c: <6.0% (42 mmol/mol). 10. Principles of lipid control. 1) The ADA recommends to intensify lifestyle therapy and optimize glycemic control for patients with triglyceride levels ≥1.7 mmol/L (150 mg/dL) and/or HDL-C levels <1.0 mmol/L (40 mg/dL) for men or <1.3 mmol/L (50 mg/dL) for women. 2) For patients with triglyceride levels ≥5.7 mmol/L (500 mg/dL), medical therapy (eg, fibrates) should be considered to reduce the risk of pancreatitis. 3) For patients with DM of all ages and overt cardiovascular disease, high-intensity statin therapy should be added to lifestyle therapy. 4) For patients aged 40 to 75 years with additional cardiovascular risk factors, consider using high-intensity statin therapy added to lifestyle therapy. 5) For patients aged <40 years or >75 years with additional cardiovascular risk factors, consider using moderate or high-intensity statin therapy added to lifestyle therapy. 6) For patients aged >40 years without additional cardiovascular risk factors, consider using moderate-intensity statin therapy added to lifestyle therapy. 1) General criteria: <140/90 mm Hg. 2) Less than 130/80 mm Hg (but not <120/70 mm Hg) in patients with diabetic nephropathy and in patients with recently diagnosed hypertension and no target organ damage, if these targets can be achieved without undue treatment burden. 3) Angiotensin-converting enzyme inhibitors (ACEIs) or angiotensin-receptor blockers (ARBs) are suggested as first-line antihypertensive agents, particularly among patients with evidence of diabetic nephropathy.Evidence 4Weak recommendation (benefits likely outweigh downsides, but the balance is close or uncertain; an alternative course of action may be better for some patients). Moderate Quality of Evidence (moderate confidence that we know true effects of intervention). Quality of Evidence lowered due to heterogeneity of risks, benefits, and adverse effects in individual patients. For discussion and references, see Appendix 2 at the end of the chapter. 1. Patient education is an important component of DM management, together with nutrition therapy, exercise, and pharmacotherapy, and it should be offered to all patients.Evidence 5Strong recommendation (benefits clearly outweigh downsides; right action for all or almost all patients). Moderate Quality of Evidence (moderate confidence that we know true effects of intervention). Quality of Evidence lowered due to uncertainty of the effects of individual components. For discussion and references, see Appendix 3 at the end of the chapter. 2. Patient education aims to improve knowledge, skills, and confidence in DM management and to promote the patient’s cooperation with a multidisciplinary therapeutic team. 3. Education programs typically cover aspects of the pathophysiology of DM, lifestyle modification, glucose self-monitoring, insulin dose-adjustment, management of hypoglycemia, prevention and detection of acute and chronic DM complications, and foot care. 4. Educational sessions should be repeated and their effects evaluated, including not only the patients’ knowledge but also their capabilities of coping with the disease. Structured education programs that promote intensive basal-bolus insulin therapy and teach the principles of dose-adjustment have been associated with improvements in glycemic control and quality of life in patients with type 1 DM. In patients with type 2 DM, education should include teaching about the likely progressive nature of the disease and the necessary gradual modifications of treatment. 5. Patient education can be optimally conducted both in an individual and a group setting. All patients with DM who use insulin or take other glucose-lowering medications that can cause hypoglycemia (eg, sulfonylureas) should learn how to check their finger-stick capillary blood glucose with a glucose meter. The recommended frequency of self-monitoring of blood glucose (SMBG) depends on the type of antidiabetic therapy and long-term stability of the patient’s clinical status. SMBG is a fundamental aspect of management in type 1 DM and is also important in patients with type 2 DM on complex insulin regimens. The ADA suggest that patients on multiple-dose insulin or insulin pump therapy should consider SMBG prior to meals and snacks, occasionally postprandially, at bedtime, prior to exercise, when hypoglycemia is suspected, after treating hypoglycemia, and prior to critical tasks such as driving. For some patients it may mean 6 or more measurements per day. Patients with type 2 DM treated with oral agents that can cause hypoglycemia also likely benefit from SMBG, particularly during uptitration of these medications (eg, testing once to twice per day before breakfast and before the evening meal). In contrast, the benefit of SMBG in patients with type 2 DM only on diet or who are treated with medications not associated with hypoglycemia is controversial. The ADA suggests that SMBG results may be helpful to guide treatment decisions in patients on noninsulin therapies. In this context, a reasonable frequency of measurements will depend on the patients’ preference. Motivated patients with type 2 DM could take action to modify diet or exercise patterns based on SMBG readings, and therefore improve their HbA1c values. The ADA recommends nutrition therapy for all patients with type 1 and type 2 DM. Nutrition therapy consists of the development of eating patterns designed to improve glycemic control, lower blood pressure, improve the lipid profile, reduce the cardiovascular risk, and reduce the overall risk for both acute and long-term complications of DM. Nutrition therapy should aim for a beneficial effect in the overall health of patients while taking into consideration their personal and cultural preferences as well as their individual nutritional needs. 1) Adequate caloric intake should ensure maintaining an ideal body weight or gradual reduction of body weight in obese or overweight patients. 2) An optimal body weight is usually a BMI between 18.5 and 24.9 kg/m2. Healthy weight-loss diets typically reduce energy intake in women to 1200-1600 calories per day, and in men to 1400-1800 calories per day, depending on the patient’s initial weight (eg, in women >135 kg, start with 1600 calories per day, and in men >135 kg, start with 1800 calories per day). Diets <1200 calories per day for women or <1400 calories per day in men are not generally recommended, because they may be deficient in nutrients. Furthermore, very low-calorie diets have not been found to produce greater long-term weight losses than conventional low-calorie diets. Overall, lifestyle modifications, which include dietary changes, are strongly recommended.Evidence 6Strong recommendation (benefits clearly outweigh downsides; right action for all or almost all patients). Moderate Quality of Evidence (moderate confidence that we know true effects of intervention). Quality of Evidence lowered due to some heterogeneity among patient-important outcomes. For discussion and references, see Appendix 4 at the end of the chapter. 3) The optimal distribution of calories from carbohydrates, protein, and fat to facilitate weight loss is unknown and likely not absolute. 4) Carbohydrate intake is the most important determinant of postprandial glucose levels in patients with DM. The ADA suggests choosing nutrient-dense carbohydrates containing vitamins, minerals, and fiber (eg, vegetables, whole grains, legumes, or fruits) over processed carbohydrates high in calories, sugar, sodium, and fat. Avoiding sugar-sweetened beverages is also recommended. 5) In patients with type 2 DM taking insulin secretagogues (eg, sulfonylureas), meals should include carbohydrates to reduce the risk of hypoglycemia. 6) Fat quality is more important than quantity for reducing the risk for cardiovascular disease. The ADA suggests to limit the intake of saturated fat to 10% of calories, limit the intake of cholesterol to <300 mg per day, and avoid trans-fat as much as possible. These recommendations apply to the general population. It is also suggested to limit sodium intake to <2300 mg per day. 1. For patients with type 2 DM (or type 1 DM) treated with fixed doses of short- and intermediate-acting insulin (frequently premixed), day-to-day consistency in the time of administration of insulin, in the meals time, and in the amount of carbohydrate intake is an important consideration to avoid variable and unpredictable blood glucose levels and hypoglycemia. These patients should not skip meals. 2. For patients with type 1 DM (or type 2 DM) on a multiple-daily injection program who take a long-acting insulin and fixed doses of a rapid-acting prandial insulin, it is important to eat similar amounts of carbohydrates during each meal to match the prandial insulin doses. This program gives more flexibility regarding the time when meals can be consumed. Different meal-planning strategies can be used to quantify carbohydrate intake (eg, sample menus, the exchange system [list of servings in 6 categories, which may be exchanged for each other, as they contain a similar amount of main nutrients], or carbohydrate counting). The ADA recommends the carbohydrate-counting approach for patients with type 1 DM on a flexible multiple-daily injection program. Patients using insulin pumps also need to learn carbohydrate counting. 1. The ADA and the American Heart Association (AHA) recommend performing at least 150 minutes of moderate-intensity aerobic physical activity (eg, brisk walking) per week. Physical activity should be distributed over at least 3 days per week, with no more than 2 consecutive days without activity, and should be supplemented by an increase in daily lifestyle activities (eg, gardening, household work). At least 90 minutes of vigorous aerobic exercise per week is an alternative. For long-term maintenance of a major weight loss, the ADA and AHA recommend a larger amount of exercise (ie, 7 hours of moderate or vigorous aerobic physical activity per week). 2. Exercise can improve glycemic control, assist with weight loss and maintenance, and affect positively different cardiovascular risk factors, including hypertension and dyslipidemia. Resistance training (eg, exercise with elastic bands or weight machines) may confer additional benefits, as it has the potential to enhance skeletal muscle mass and improve muscle strength and insulin sensitivity. 3. Patients with significant hyperglycemia (eg, blood glucose ≥13.9 mmol/L [250 mg/dL]) should avoid vigorous exercise because they may experience worsening of hyperglycemia and ketosis. Other occasional complications associated with strenuous physical activity include foot-stress fractures, retinal bleeding in patients with proliferative retinopathy (particularly during resistance training), and acute coronary events. 4. Although many individuals with DM do not need exercise stress testing before undertaking exercise more intense than brisk walking, pre-exercise evaluation and exercise stress testing should be considered in those at high risk for cardiovascular disease (eg, multiple cardiovascular risk factors, known coronary artery disease, cerebrovascular disease, or peripheral artery disease), advanced nephropathy with renal failure, or cardiovascular autonomic neuropathy. 5. Patients receiving insulin treatment should measure their blood glucose before, during, and after exercise to identify glycemic patterns that can be used to develop strategies to avoid hypoglycemia. Ideally, exercise should be performed at similar times and in a consistent relation to meals and insulin injections. Some strategies to prevent hypoglycemia include consuming extra carbohydrates before exercise and then at 30-minute intervals during exercise (eg, 15-30 grams of quickly absorbed carbohydrates) as well as after the end of exercise if it was prolonged; this is particularly important in type 1 DM. In type 2 DM, the risk of hypoglycemia is lower and obese patients do not usually need extra carbohydrates during exercise. 6. Avoid insulin injections in the body areas that are especially active during a particular activity (eg, thigh) and reduce the dose of the insulin that affects time when exercise will be performed (eg, by 30%-50%), depending on the exercise intensity and glucose levels. 1) Type 1 DM: All patients with type 1 DM should be treated with insulin from the moment of diagnosis (LADA may be an exception). These patients should not stop their basal insulin administration, even during fasting. a) Presenting with an acute DM complication or with significant hyperglycemia at the time of diagnosis (eg, DKA, HHS, FPG >16.7 mmol/L [300 mg/dL], HbA1c >11% [97 mmol/mol]). The requirement for insulin may be temporal. b) Failure of noninsulin antidiabetic treatment despite the intensification of pharmacotherapy and lifestyle and behavioral interventions. In these patients, insulin therapy should not be delayed. Insulin regimens can be combined with other noninsulin antidiabetic medications. Metformin is frequently used in this setting. c) During hospitalization, as it allows more flexibility for the management of hyperglycemia during acute illness. 2. Types of insulin: Table 3. The selection of insulin preparations and insulin regimen should be individually adapted to the patient’s lifestyle, usual mealtimes, and preferences. a) Intermediate-acting human insulin (insulin isophane [NPH]) is administered subcutaneously once or twice daily (typically in the morning before breakfast, and before the evening meal or at bedtime). It is frequently given in combination with short-acting insulin. b) Long-acting insulin analogues are usually administered subcutaneously once daily, in the morning or evening, at a fixed time. However, the effect of insulin detemir can last <24 hours, and therefore twice a day administration is frequently required with this basal insulin (in the morning and evening). In occasional situations, insulin glargine also requires twice-daily dosing (eg, early morning hyperglycemia in patients taking insulin glargine before breakfast who also experience hypoglycemia while fasting during the day, patients susceptible to hypoglycemia while on very low total daily doses of insulin, patients using very high basal insulin doses). Long-acting analogues are frequently used in combination with rapid-acting insulin analogues as part of an intensive insulin therapy regimen (Figure 1). a) Rapid-acting insulin analogues are administered subcutaneously immediately (within 0-15 minutes) before a meal, though they may also be administered during and immediately after mealtime, usually 3 times a day. b) Short-acting human insulin (regular insulin) is administered subcutaneously within 45 minutes before meals, usually 3 times a day. It is commonly administered together with intermediate-acting insulin (Figure 2). a) Premixed human insulins: Short-acting human insulin combined with intermediate-acting insulin. b) Premixed insulin analogues: Rapid-acting insulin analogue combined with long-acting protamine suspension of this analogue. With premixed insulin preparations, the proportion of short-acting to long-acting insulin is fixed. Depending on the preparation, 50% to 80% of the insulin dose is given as an intermediate-acting or long-acting form of insulin (Table 4). Each of the insulin preparations in the combination product achieves its peak activity at a different time. The peaks associated with the effect of rapid-acting insulin or short-acting insulin are higher and their duration is shorter than those associated with intermediate- or long-acting insulins. These premixed insulin preparations are typically administered as 2 daily doses, before breakfast and before the evening meal (Figure 3). Patients must consume a meal after each injection and should follow a diet consistent in carbohydrates from day to day with meals consumed at similar times of the day. Because of the fixed ratios of insulins, individual basal and prandial dose adjustments cannot be made. Premixed insulin preparations should ideally be used after the basal insulin requirements were first established. 3. Initial insulin doses: Most patients with type 1 DM are sensitive to insulin and require total daily insulin doses close to 0.3 U/kg. In type 1 DM, insulin regimens typically try to mimic the physiologic release of insulin by administering a basal form of insulin (eg, glargine or detemir) and meal-time (prandial) boluses of short- or rapid-acting insulin. As an initial strategy, half of the total daily insulin dose can be administered as basal (eg, 0.15 U/kg) and half as the daily prandial dose (eg, 0.15 U/kg divided in 3 doses given with each main meal). In contrast, in type 2 DM it should be considered if significant hyperglycemia requires full doses of insulin (eg, 0.3-0.6 U/kg/d) or if appropriate glycemic control can be achieved with low doses of intermediate- or long-acting insulin added to other glucose-lowering medications (10 U or 0.1-0.2 U/kg/d of a long- or intermediate-acting insulin). When full doses of insulin are required (0.3-0.6 U/kg/d), patients who are sensitive to insulin or predisposed to complications of hypoglycemia (eg, thin, elderly, those with adrenal insufficiency, advanced kidney disease, cirrhosis, unstable coronary disease, active intracranial pathology, terminal illness) require lower starting insulin doses than those who are more insulin-resistant (eg, obese, on supraphysiological glucocorticoid treatment). 4. Insulin regimens: It is important to note that there is no uniformly accepted “best available” way of prescribing insulin and monitoring its effects. In general, in type 2 DM all insulin regimens should be combined with metformin, if not contraindicated. Insulin therapy should not be unduly delayed, because persistent hyperglycemia and elevated proinsulin levels accelerate the progression of the complications of DM. 1) Single-dose insulin program: Typically used in patients with type 2 DM in whom a combined treatment with 2 or 3 oral antidiabetic agents (including or not a GLP-1 agonist) is ineffective and who are transitioning to insulin therapy. One injection of intermediate-acting insulin (NPH) or a long-acting insulin analogue (eg, glargine or detemir) is given once a day at about the same time. Patients with high fasting plasma glucose levels are commonly advised to administer insulin in the evening, while patients with normal fasting plasma glucose levels and daytime hyperglycemia are advised to administer insulin in the morning before breakfast. Preprandial glucose targets are individualized (eg, glucose levels between 4.4 and 6.7 mmol/L [80-120 mg/dL] in younger patients without major comorbidities, or between 5.6 and 7.8 mmol/L [100-140 mg/dL] in elderly patients with long-standing DM). At least 4 hours should elapse between a meal and a subsequent preprandial measurement. In patients with persistently elevated HbA1c levels despite a single-dose insulin program or in those requiring >40 U/d, a more complex insulin regimen is frequently needed. Once prandial insulin is added, oral insulin secretagogues can be discontinued. Patients using a single dose of NPH insulin are instructed to monitor their capillary glucose levels before breakfast and before the evening meal. If blood glucose levels are consistently (eg, 3 days in a row) above the individualized target range before breakfast and before the evening meal, the insulin dose should be increased by 10% to 20%. If blood glucose levels are consistently below the individualized target range before breakfast and before the evening meal, the insulin dose should be decreased by 10% to 20%. If unexplained symptomatic hypoglycemia occurs at any time (despite consuming adequate meals), the insulin dose may be too high and therefore should be decreased by 10% to 20%. If blood glucose levels are consistently within the individualized target range at one time of the day, but consistently outside the individualized target range at another, the single-dose insulin program likely needs to be changed. 2) Split-dose intermediate-acting insulin program: A split-dose intermediate-acting insulin program with NPH insulin twice a day is used by some patients with type 2 DM. Patients on this program take one NPH insulin injection 30 minutes before breakfast and one NPH insulin injection 30 minutes before the evening meal or at bedtime (depending on the patient’s sleep habits, early morning hyperglycemia between 2:00 and 8:00—“dawn phenomenon”—may be better controlled with NPH insulin given at bedtime due to the timing of its peak effect). Capillary blood glucose measurements before breakfast and before the evening meal are required to estimate if the insulin doses are appropriate. For the morning dose adjustments, the blood glucose measurements before the evening meal are evaluated. For the evening dose adjustments, the blood glucose measurements before breakfast of the following day are evaluated. The insulin doses can be adjusted by 10% to 20% based on personalized preprandial glycemic targets. Patients on this program need to follow a diet that has a consistent amount of carbohydrates and eat their meals at about the same time every day. 3) Split mixed-dose insulin program: A split mixed-dose insulin program with intermediate-acting insulin (NPH) plus either short-acting insulin (regular) or rapid-acting insulin (aspart, lispro, or glulisine) administered each with breakfast and the evening meal is occasionally used. Before breakfast, patients on this program take an injection of NPH insulin plus an injection of either rapid-acting insulin or short-acting insulin. Before the evening meal, they also get an injection of NPH insulin plus an injection of one of the prandial insulin preparations. Patients are instructed to check their capillary glucose levels before breakfast, before the noon meal, before the evening meal, and at bedtime. They need to follow a diet that has a consistent amount of carbohydrates and eat their main meals at about the same time every day. The glucose measurements before breakfast indicate the effectiveness of the evening-meal NPH insulin administered the previous day. The glucose measurements before the noon meal indicate the effectiveness of the breakfast rapid-acting insulin (or short-acting insulin). The glucose measurements before the evening meal indicate the effectiveness of the breakfast NPH insulin dose. The glucose measurements before bedtime indicate the effectiveness of the evening-meal prandial insulin. The insulin doses are changed by 10% to 20% during each dose adjustment. 4) Premixed split-dose insulin program: In a premixed split-dose insulin program, one of the premixed insulin preparations (Table 4) is administered twice a day, before breakfast and before the evening meal. A common practice is to initially give about 60% of the total daily insulin doses in the morning and about 40% in the evening. Patients are instructed to check their capillary blood glucose levels before breakfast, before the noon meal, before the evening meal, and at bedtime. Patients need to follow a diet that has a consistent amount of carbohydrates and eat their main meals at about the same time every day. Hypoglycemia could be the consequence, for example, of skipping or delaying a meal, eating fewer carbohydrates than usual, or doing an unusual amount of physical activity. In this program, the glucose measurements before the noon meal and before the evening meal indicate the effectiveness of the morning premixed insulin dose. The glucose measurements before bedtime and before breakfast the next day indicate the effectiveness of the evening premixed insulin dose. If the blood glucose values before the noon meal and before the evening meal are both consistently (eg, for 3 days in a row) above or below the individualized target range, then the breakfast premixed insulin dose should be increased or decreased by 10% to 20%. If the blood glucose levels are within the goal range either before the noon meal or before the evening meal, but outside the goal range at the other time (before the evening meal or before the noon meal), then the premixed split-dose insulin program may need to be changed. If the blood glucose values at bedtime and before breakfast the next day are both consistently above or below the individualized target range, then the evening-meal premixed insulin dose should be increased or decreased by 10% to 20%. If blood glucose levels are within the goal range either at bedtime or before breakfast the next day, but outside the goal range at the other time (before breakfast the next day or at bedtime), then the premixed split-dose insulin program may need to be changed. 5) Multiple daily injection insulin program: This is the principal method of treatment of type 1 DM, which is also recommended in patients with type 2 DM who require full insulin replacement and can accommodate insulin injections 4 times a day. Typically, the program consists of a combination of long-acting basal insulin (eg, glargine or detemir) given once daily in the morning or evening, and rapid-acting insulin (aspart, lispro or glulisine) with meals 3 times a day. This basal-bolus regimen is supplemented by correction scales that add or subtract units to the rapid-acting insulin prandial doses. Patients are instructed to check their capillary blood glucose levels before breakfast, before the noon meal, before the evening meal, and at bedtime. When the dose of a long-acting insulin analogue is appropriate, overnight blood glucose levels (difference between bedtime and prebreakfast glucose readings) should stay steady (eg, not increasing or decreasing >2.2 mmol/L [40 mg/dL]). The postprandial glycemic excursions, different levels of physical activity, and the effect of prandial insulin are not present overnight; therefore, this period is optimal to assess the basal insulin requirements. If blood glucose levels consistently drop overnight (eg, >2.2 mmol/L [40 mg/dL] between bedtime and breakfast), the dose of the long-acting insulin should be decreased by 10% to 20%. If blood glucose levels consistently rise overnight (eg, >2.2 mmol/L [40 mg/dL] between bedtime and breakfast), the dose of the long-acting insulin should be increased by 10% to 20%. To adjust the prandial insulin doses, the blood glucose values before the next meal (or at bedtime) should be assessed. The glucose measurements before the noon meal indicate the effectiveness of the breakfast rapid-acting insulin. The glucose measurements before the evening meal indicate the effectiveness of the noon-meal rapid-acting insulin. The glucose measurements before bedtime indicate the effectiveness of the evening-meal rapid-acting insulin. The objective is to keep the preprandial and bedtime glucose values within the individualized glycemic target. Another way to adjust the prandial insulin doses is to check the postprandial glucose levels (1-2 hours after the beginning of the meal). However, this approach adds burden to the program by requiring more capillary glucose measurements and is not necessary in the majority of cases. The prandial insulin doses depend on how many carbohydrates are present in the diet. 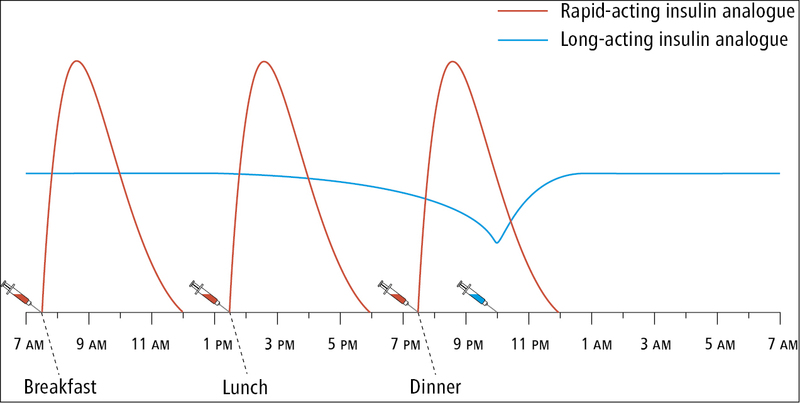 Two strategies can be followed when planning the prandial insulin therapy: (a) fixed meal insulin doses following a diet consistent in carbohydrates on consecutive days; (b) carbohydrate counting: For this purpose, the ratio of insulin to grams of carbohydrate (number of grams of carbohydrate covered by 1 U of rapid-acting insulin) is calculated for each meal. 6) Continuous subcutaneous insulin infusion (CSII) or insulin pump therapy: Insulin pumps are devices designed to administer short- or rapid-acting insulin analogues in a subcutaneous infusion, providing both a continuous basal infusion (between 40% and 60% of the total daily insulin dose) and mealtime boluses. Insulin pumps allow programming the delivery for multiple basal rates. The dose of the prandial boluses is based on the estimated meal carbohydrate content and the capillary blood glucose level immediately before each meal. Insulin pumps also have features that allow adjustments for the “residual insulin” action from previous boluses, potentially reducing the risk of hypoglycemia from frequent administration of boluses. The advantages of insulin pump therapy include fewer injections, the possibility of giving very low doses of insulin (doses as low as 0.05 U can be accurately delivered, a feature particularly useful in small children), the possibility of delivering more than 1 basal rate (useful, for example, for treating the dawn phenomenon, or for patients with different basal requirements during periods of intense physical activity), and lifestyle flexibility with respect to eating schedules. There is also evidence indicating that in motivated patients properly trained on pump-management skills, CSII can provide a tighter glycemic control and lower risk of severe hypoglycemia. Insulin pump therapy is not recommended for patients who are unwilling or unable to perform a minimum of 4 blood glucose tests per day. CSII requires patient training in the fundamental aspects of intensive insulin therapy, carbohydrate counting, and manipulation of the insulin pump settings. Potential risks associated with insulin pump therapy include the blockage or leakage of the system (leading to rapid hyperglycemia and potentially DKA in patients with type 1 DM), infections at the infusion site, and hypoglycemia (eg, if the basal insulin dose is too high and the patient skips a meal). Another disadvantage is the high cost of the pump and supplies. Continuous glucose monitoring (CGM) systems measure the interstitial fluid glucose level, which is generally within 15% to 20% of the capillary glucose concentration, and provide semicontinuous information about glucose levels that identifies fluctuations difficult to assess with conventional capillary blood glucose self-monitoring. These systems are now commonly used in conjunction with CSII (a sensor-augmented insulin pump) to give more information about the patients’ glycemic patterns. CGM systems can play a valuable role in the management of patients with hypoglycemia unawareness. Some sensor-augmented pumps can be programmed to interrupt insulin delivery for up to 2 hours at a preset sensor glucose value (the threshold-suspend feature). This feature can reduce the frequency of nocturnal hypoglycemia and severe hypoglycemia without increasing HbA1c values or causing DKA. Patients considering using a CGM device should be willing to perform frequent capillary blood glucose measurements and to calibrate the system daily. Overall, CSII (particularly sensor-augmented insulin pumps with threshold-suspend feature) should be offered to individuals with type 1 DM in whom there is concern about hypoglycemia unawareness or high risk for severe hypoglycemia,Evidence 7Strong recommendation (benefits clearly outweigh downsides; right action for all or almost all patients). Moderate Quality of Evidence (moderate confidence that we know true effects of intervention). Quality of Evidence lowered as some critical patient-important outcome measures have not been explored. For discussion and references, see Appendix 5 at the end of the chapter. to patients requiring very low doses of insulin that cannot be given by syringes or pens, or to those who wish a tighter glycemic control with more flexible eating schedules.Evidence 8Weak recommendation (benefits likely outweigh downsides, but the balance is close or uncertain; an alternative course of action may be better for some patients). Low Quality of Evidence (low confidence that we know true effects of intervention). Quality of Evidence lowered as some critical patient-important outcome measures have not been explored. For discussion and references, see Appendix 5 at the end of the chapter. All such patients should be willing and able to learn the complexities of CSII therapy and follow closely their glycemic patterns. 1. When choosing an antidiabetic medication for patients with type 2 DM, the glucose-lowering efficacy, safety profile, tolerability, convenience, and cost of the available agents should be considered. The effect on weight and the risk of causing hypoglycemia are also important aspects to review. 2. There is no individual agent with an absolute therapeutic advantage over the others in all patients; therefore, a patient-centered approach that takes into consideration the patients’ individual characteristics, needs, values, and preferences is recommended. Although there are uncertainties regarding the best choice and sequence of therapy, the general consensus is that metformin should be used as the initial drug for treatment of type 2 DM if there are no contraindications (eg, advanced renal failure).Evidence 9Weak recommendation (benefits likely outweigh downsides, but the balance is close or uncertain; an alternative course of action may be better for some patients). Moderate Quality of Evidence (moderate confidence that we know true effects of intervention). Quality of Evidence lowered due to heterogeneity of risks, benefits, and adverse effects in individual patients. For discussion and references, see Appendix 1 at the end of the chapter. Metformin has a relatively strong glucose-lowering effect, possible cardiovascular benefits, proven long-term safety, and is widely available at a low cost. 3. With type 2 DM progression, combination therapy with other oral or injectable medications is frequently needed, and ultimately insulin is required in an important proportion of patients. 4. Dosages, mechanism of action, advantages and disadvantages of the available antidiabetic agents: Table 5. 5. In general, when metformin alone is contraindicated or has failed, treatment should be individualized on a case-by-case basis rather than by applying one possible algorithm rigidly. The benefits and downsides of each medication should be evaluated in the specific context of each patient. 6. Shared decision-making tools have been developed and can be used as aids that enable conversations resulting in DM treatment regimens consistent with the preferences and values of the patients. 7. Recently, one of SGLT-2 inhibitors, empagliflozin, when used among patients with type 2 DM at the highest risk of cardiovascular disease (history of myocardial infarction, ~45%; coronary artery bypass grafting, ~25%; stroke, >20%; any coronary artery disease, >75%) showed a decrease in total mortality, cardiovascular mortality, and hospitalization for heart failure and should be considered among such high-risk patients.Evidence 10Weak recommendation (benefits likely outweigh downsides, but the balance is close or uncertain; an alternative course of action may be better for some patients). A weak rather than strong recommendation is related to the restricted character of the population studied. High Quality of Evidence (high confidence that we know true effects of intervention). Zinman B, Wanner C, Lachin JM, et al; EMPA-REG OUTCOME Investigators. Empagliflozin, Cardiovascular Outcomes, and Mortality in Type 2 Diabetes. N Engl J Med. 2015 Nov 26;373(22):2117-28. doi: 10.1056/NEJMoa1504720. Epub 2015 Sep 17. PubMed PMID: 26378978. 8. Do not delay insulin therapy in patients in whom it is indicated. 9. Always adjust the doses of oral antidiabetic agents to the glycemic profile (see Follow-Up, below). 1) Check the capillary glucose level immediately when there are symptoms of hypoglycemia. 2) Treat with 15 g of carbohydrates (eg, 4 4-gram glucose tablets, 100 to 125 mL of fruit juice, 1 tablespoon of sugar or syrup). 3) Wait 15 minutes and recheck the blood glucose level. 4) Treat again with 15 grams of carbohydrates if the capillary blood glucose concentration remains low or if there are still symptoms of hypoglycemia, and continue to recheck the capillary glucose levels until they are in or above the patient’s target range and there are no more symptoms of hypoglycemia. Patients with DM on insulin therapy should have a glucagon injection available to treat severe hypoglycemia (hypoglycemia requiring assistance from another person for recovery or resulting in loss of consciousness or seizure). Acute illnesses frequently lead to worsening of hyperglycemia and increased insulin requirements. Patients with type 1 DM or type 2 DM on a multiple daily injection insulin program likely benefit from learning management strategies that can be applied during an acute sickness (“sick-day guidelines”). These strategies include monitoring blood glucose levels more frequently, keeping good hydration, avoiding exercise as it may worsen hyperglycemia, checking for urine ketones if there is severe and persistent hyperglycemia, using extra doses of rapid-acting insulin to temporarily correct hyperglycemia—“insulin supplements”—and knowledge of when to contact the health-care providers. 1. Whole pancreas transplantation is most frequently used in patients with renal failure in whom the pancreas is transplanted simultaneously with kidney transplantation. 2. Pancreatic islet transplantation is associated with a lower risk than whole pancreas transplantation and allows for the normalization of blood glucose levels; however, its use is limited by poor graft survival. 1. Glycemic control: The ADA recommends checking the HbA1c levels based on the clinical situation. For patients with well-controlled DM, testing twice per year is appropriate. For unstable or highly intensively managed patients, testing every 3 months is appropriate. 2. Screening for hypertension: The ADA advises to measure the blood pressure at every routine medical visit. Elevated values should be confirmed on a separate day. 3. Screening for dyslipidemia: The ADA recommends to measure the fasting lipid profile at least annually in most adult patients with DM, but suggests postponing the lipid assessment for 2 years in adults with low-risk lipid values (LDL-C <5.6 mmol/L [100 mg/dL], HDL-C >2.8 mmol/L [50 mg/dL], and triglycerides <8.3 mmol/L [150 mg/dL]). 1) Nephropathy: The ADA advises performing an annual test to quantitate urine albumin excretion in patients with type 1 DM lasting ≥5 years, and in all patients with type 2 DM since the time of diagnosis. Serum creatinine with an estimated glomerular filtration rate should also be measured at least annually. 2) Retinopathy: The ADA recommends that patients with type 1 DM should have an initial dilated and comprehensive eye examination by an ophthalmologist or optometrist within 5 years after the onset of DM. In patients with type 2 DM, this should be done shortly after the diagnosis of DM. If there is no evidence of retinopathy for 1 or more eye examinations, then examinations every 2 years may be considered. If diabetic retinopathy is present, subsequent examinations should be repeated at least annually, or more frequently as per ophthalmology recommendations. 3) Diabetic foot complications: The International Working Group on Diabetic Foot Editorial Board and the ADA recommend that all patients with DM should have a thorough foot examination at least once annually, and more frequently if high-risk foot conditions (eg, diabetic peripheral neuropathy, foot deformities, or peripheral artery disease) are identified. The ADA also advises that visual inspection of the feet should be performed at every healthcare visit. 1. Type 1 DM: There are no effective methods of prevention. 2. Type 2 DM: Effective preventive measures include a healthy diet and increased physical activity to reduce excessive weight and maintain an appropriate body weight. Metformin can reduce the risk of progression of prediabetes to DM, and therefore could be considered in this situation. GAD, glutamic acid decarboxylase; LADA, latent autoimmune diabetes in adults. a Adapted from the American Diabetes Association and the European Association for the Study of Diabetes 2012 position statement. b Predicted reduction of HbA1c levels with monotherapy (expressed in percentage points). ↑, increase; ↓, decrease; bid, 2 times a day; eGFR, estimated glomerular filtration rate; GFR, glomerular filtration rate; GI, gastrointestinal; GIP, glucose-dependent insulinotropic polypeptide; GLP-1, glucagon-like peptide-1; HbA1c, hemoglobin A1c; HDL-C, high-density lipoprotein cholesterol; INN, International Nonproprietary Name; LDL-C, low-density lipoprotein cholesterol; po, oral administration; MEN, multiple endocrine neoplasia; PPAR-gamma, peroxisome proliferator-activated receptor gamma; tid, 3 times a day. Figure 1. Intensive insulin therapy regimen with 4 insulin injections a day: a rapid-acting insulin analogue combined with a long-acting insulin analogue. Figure 2. Intensive insulin therapy regimen with 4 insulin injections a day: a short-acting insulin combined with an intermediate-acting insulin (neutral protamine Hagedorn). Figure 3. Treatment regimen with a premixed human insulin (short-acting insulin plus intermediate-acting insulin) administered twice a day. In contrast with UKPDS, the ADVANCE trial,6 the VADT,7 and the ACCORD trial8 included older patients with long-standing DM and at high risk for cardiovascular disease. In these studies, intensive therapy (HbA1c levels of 6.5% in ADVANCE, 6.9% VADT, and 6.4% in ACCORD) delayed the progression of albuminuria but did not decrease the rates of other microvascular complications or cardiovascular mortality when compared with standard therapy (HbA1c levels of 7.3% in ADVANCE, 8.4% in VADT, and 7.5% in ACCORD). 1 The effect of intensive treatment of diabetes on the development and progression of long-term complications in insulin-dependent diabetes mellitus. The Diabetes Control and Complications Trial Research Group. N Engl J Med. 1993 Sep 30;329(14):977-86. PubMed PMID: 8366922. 2 Nathan DM, Cleary PA, Backlund JY, et al; Diabetes Control and Complications Trial/Epidemiology of Diabetes Interventions and Complications (DCCT/EDIC) Study Research Group. Intensive diabetes treatment and cardiovascular disease in patients with type 1 diabetes. N Engl J Med. 2005 Dec 22;353(25):2643-53. PubMed PMID: 16371630; PubMed Central PMCID: PMC2637991. 3 Intensive blood-glucose control with sulphonylureas or insulin compared with conventional treatment and risk of complications in patients with type 2 diabetes (UKPDS 33). UK Prospective Diabetes Study (UKPDS) Group. Lancet. 1998 Sep 12;352(9131):837-53. Erratum in: Lancet 1999 Aug 14;354(9178):602. PubMed PMID: 9742976. 4 Intensive blood-glucose control with sulphonylureas or insulin compared with conventional treatment and risk of complications in patients with type 2 diabetes (UKPDS 33). UK Prospective Diabetes Study (UKPDS) Group. Lancet. 1998 Sep 12;352(9131):837-53. Erratum in: Lancet 1999 Aug 14;354(9178):602. PubMed PMID: 9742976. 5 Holman RR, Paul SK, Bethel MA, Matthews DR, Neil HA. 10-year follow-up of intensive glucose control in type 2 diabetes. N Engl J Med. 2008 Oct 9;359(15):1577-89. doi: 10.1056/NEJMoa0806470. Epub 2008 Sep 10. PubMed PMID: 18784090. 6 ADVANCE Collaborative Group, Patel A, MacMahon S, Chalmers J, et al. Intensive blood glucose control and vascular outcomes in patients with type 2 diabetes. N Engl J Med. 2008 Jun 12;358(24):2560-72. doi: 10.1056/NEJMoa0802987. Epub 2008 Jun 6. PubMed PMID: 18539916. 7 Duckworth W, Abraira C, Moritz T, et al; VADT Investigators. Glucose control and vascular complications in veterans with type 2 diabetes. N Engl J Med. 2009 Jan 8;360(2):129-39. doi: 10.1056/NEJMoa0808431. Epub 2008 Dec 17. Erratum in: N Engl J Med. 2009 Sep 3;361(10):1028. N Engl J Med. 2009 Sep 3;361(10):1024-5. PubMed PMID: 19092145. 8 Action to Control Cardiovascular Risk in Diabetes Study Group, Gerstein HC, Miller ME, Byington RP, et al. Effects of intensive glucose lowering in type 2 diabetes. N Engl J Med. 2008 Jun 12;358(24):2545-59. doi: 10.1056/NEJMoa0802743. Epub 2008 Jun 6. PubMed PMID: 18539917; PubMed Central PMCID: PMC4551392. In contrast, there is limited evidence for the benefits of aiming for lower blood pressure levels. A Cochrane systematic review evaluated if lower blood pressure targets (<130/85 mm Hg) in patients with DM were associated with reduction in mortality and/or morbidity compared with standard blood pressure treatment goals (<140-160/90-100 mm Hg).4 Only one study was found—the ACCORD BP trial—that investigated if intensive antihypertensive treatment targeting normal systolic blood pressure (ie, <120 mm Hg) in patients with type 2 DM reduces major cardiovascular events.5 Despite achieving significantly lower blood pressures (mean systolic blood pressure 119.3 mm Hg in the intensive-therapy group vs 133.5 mm Hg in the standard-therapy group), the only significant benefit in the intensive-therapy group was a reduction in the incidence of stroke, which, although statistically significant, had a small magnitude (absolute risk reduction of 1.1%; 91 people needed to be treated intensively during 4.7 years to prevent 1 additional stroke). The intensive-therapy group also had a significantly larger increase in the risk of serious adverse effects attributed to the antihypertensive medications, including hypotension, syncope, bradycardia or arrhythmia, hyperkalemia, angioedema, and renal failure (absolute risk increase, 2.0%; 1 excessive serious adverse event for every 50 patients treated intensively). The Cochrane systematic review also identified 4 trials that evaluated lower diastolic blood pressure targets and that failed to reduce the risk of stroke, myocardial infarction, or congestive heart failure.6 Based on the available evidence, a weak recommendation against treating blood pressure to normal levels (ie, <120/80 mm Hg) can be made. 1 James PA, Oparil S, Carter BL, et al. 2014 evidence-based guideline for the management of high blood pressure in adults: report from the panel members appointed to the Eighth Joint National Committee (JNC 8). JAMA. 2014 Feb 5;311(5):507-20. doi: 10.1001/jama.2013.284427. Erratum in: JAMA. 2014 May 7;311(17):1809. PubMed PMID: 24352797. 2 American Diabetes Association. Standards of Medical Care in Diabetes – 2015. Diabetes Care 2015;38(Suppl 1):S1-S93. 3 James PA, Oparil S, Carter BL, et al. 2014 evidence-based guideline for the management of high blood pressure in adults: report from the panel members appointed to the Eighth Joint National Committee (JNC 8). JAMA. 2014 Feb 5;311(5):507-20. doi: 10.1001/jama.2013.284427. Erratum in: JAMA. 2014 May 7;311(17):1809. PubMed PMID: 24352797. 4 Arguedas JA, Leiva V, Wright JM. Blood pressure targets for hypertension in people with diabetes mellitus. Cochrane Database Syst Rev. 2013 Oct 30;10:CD008277. doi: 10.1002/14651858.CD008277.pub2. Review. PubMed PMID: 24170669. 5 ACCORD Study Group, Cushman WC, Evans GW, Byington RP, et al. Effects of intensive blood-pressure control in type 2 diabetes mellitus. N Engl J Med. 2010 Apr 29;362(17):1575-85. doi: 10.1056/NEJMoa1001286. Epub 2010 Mar 14. PubMed PMID: 20228401; PubMed Central PMCID: PMC4123215. 6 Arguedas JA, Leiva V, Wright JM. Blood pressure targets for hypertension in people with diabetes mellitus. Cochrane Database Syst Rev. 2013 Oct 30;10:CD008277. doi: 10.1002/14651858.CD008277.pub2. Review. PubMed PMID: 24170669. 7 American Diabetes Association. Standards of Medical Care in Diabetes – 2015. Diabetes Care 2015;38(Suppl 1):S1-S93. 8 James PA, Oparil S, Carter BL, et al. 2014 evidence-based guideline for the management of high blood pressure in adults: report from the panel members appointed to the Eighth Joint National Committee (JNC 8). JAMA. 2014 Feb 5;311(5):507-20. doi: 10.1001/jama.2013.284427. Erratum in: JAMA. 2014 May 7;311(17):1809. PubMed PMID: 24352797. 9 James PA, Oparil S, Carter BL, et al. 2014 evidence-based guideline for the management of high blood pressure in adults: report from the panel members appointed to the Eighth Joint National Committee (JNC 8). JAMA. 2014 Feb 5;311(5):507-20. doi: 10.1001/jama.2013.284427. Erratum in: JAMA. 2014 May 7;311(17):1809. PubMed PMID: 24352797. 10 Wu HY, Huang JW, Lin HJ, et al. Comparative effectiveness of renin-angiotensin system blockers and other antihypertensive drugs in patients with diabetes: systematic review and bayesian network meta-analysis. BMJ. 2013 Oct 24;347:f6008. doi: 10.1136/bmj.f6008. Review. PubMed PMID: 24157497; PubMed Central PMCID: PMC3807847. 11 Cheng J, Zhang W, Zhang X, et al. Effect of angiotensin-converting enzyme inhibitors and angiotensin II receptor blockers on all-cause mortality, cardiovascular deaths, and cardiovascular events in patients with diabetes mellitus: a meta-analysis. JAMA Intern Med. 2014 May;174(5):773-85. doi: 10.1001/jamainternmed.2014.348. PubMed PMID: 24687000. 1 Deakin T, McShane CE, Cade JE, Williams RD. Group based training for self-management strategies in people with type 2 diabetes mellitus. Cochrane Database Syst Rev. 2005 Apr 18;(2):CD003417. Review. Update in: Cochrane Database Syst Rev. 2015;6:CD003417. PubMed PMID: 15846663. 2 Duke SA, Colagiuri S, Colagiuri R. Individual patient education for people with type 2 diabetes mellitus. Cochrane Database Syst Rev. 2009 Jan 21;(1):CD005268. doi: 10.1002/14651858.CD005268.pub2. Review. PubMed PMID: 19160249. 1 Nield L, Moore HJ, Hooper L, et al. Dietary advice for treatment of type 2 diabetes mellitus in adults. Cochrane Database Syst Rev. 2007 Jul 18;(3):CD004097. Review. PubMed PMID: 17636747. 2 Look AHEAD Research Group, Wing RR, Bolin P, Brancati FL, et al. Cardiovascular effects of intensive lifestyle intervention in type 2 diabetes. N Engl J Med. 2013 Jul 11;369(2):145-54. doi: 10.1056/NEJMoa1212914. Epub 2013 Jun 24. Erratum in: N Engl J Med. 2014 May 8;370(19):1866. PubMed PMID: 23796131; PubMed Central PMCID: PMC3791615. 1 Misso ML, Egberts KJ, Page M, O'Connor D, Shaw J. Continuous subcutaneous insulin infusion (CSII) versus multiple insulin injections for type 1 diabetes mellitus. Cochrane Database Syst Rev. 2010 Jan 20;(1):CD005103. doi: 10.1002/14651858.CD005103.pub2. Review. PubMed PMID: 20091571. 2 Misso ML, Egberts KJ, Page M, O'Connor D, Shaw J. Continuous subcutaneous insulin infusion (CSII) versus multiple insulin injections for type 1 diabetes mellitus. Cochrane Database Syst Rev. 2010 Jan 20;(1):CD005103. doi: 10.1002/14651858.CD005103.pub2. Review. PubMed PMID: 20091571. 3 Langendam M, Luijf YM, Hooft L, Devries JH, Mudde AH, Scholten RJ. Continuous glucose monitoring systems for type 1 diabetes mellitus. Cochrane Database Syst Rev. 2012 Jan 18;1:CD008101. doi: 10.1002/14651858.CD008101.pub2. Review. PubMed PMID: 22258980. 4 Langendam M, Luijf YM, Hooft L, Devries JH, Mudde AH, Scholten RJ. Continuous glucose monitoring systems for type 1 diabetes mellitus. Cochrane Database Syst Rev. 2012 Jan 18;1:CD008101. doi: 10.1002/14651858.CD008101.pub2. Review. PubMed PMID: 22258980.